The efficient 1000-Watt Sunleaves OptiLUME Metal Halide Lamp emulates natural sunlight and promotes bounteous vegetative growth as it distributes light energy concentrated in the blue-yellow portion of the spectrum. Universal design allows horizontal and base up operation while the 10,000-hour life rating and one-year warranty assures dependable performance. 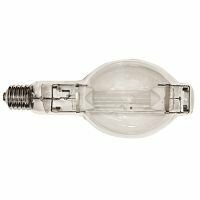 This high-output OptiLUME lamp emits 110,000 initial lumens and works with most 1000-watt metal halide and two-way HID systems.